The track objective is to provide a forum for the development of math-aware technologies, standards, algorithms, and formats that can lead towards fulfilling the dream of a global Digital Mathematical Library (DML). The DML track also serves as an interdisciplinary venue to share experience and best practices among projects in digital libraries, natural language processing, optical character recognition, pattern recognition, information retrieval, and other areas that could change the paradigm for creating, storing, preserving, searching, and interacting with a mathematical corpus. 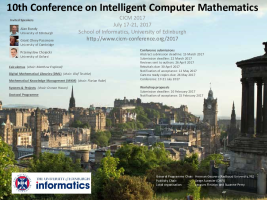 All accepted papers will address problems that arise specifically in the context of mathematical content. Nevertheless, authors of contributions that rely on sophisticated mathematical knowledge and algorithms might consider submitting their papers to the Mathematical Knowledge Management (MKM) track. Authors who wish to describe prototype DML systems and projects might consider submitting complementary papers to the Systems and Data track.